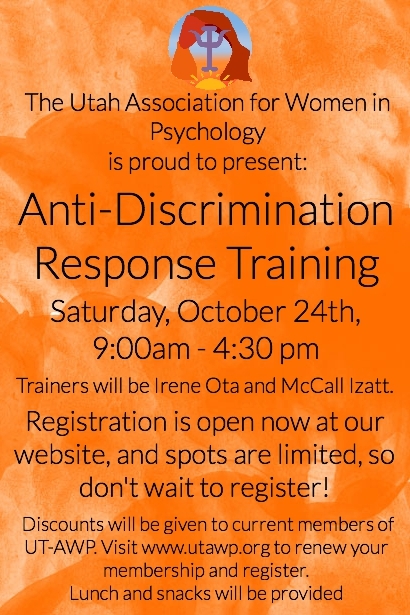 Anti-Discrimination Response Training Registration is now open! We’re beginning the new program year with our Anti-discrimination Response Training (ART), which we believe is an extremely valuable training for not just mental health professionals, but everyone who is navigating how to respond when they see or hear discriminatory comments or actions. We have a very limited number of spots available for this training, so please register as soon as possible. Also, if you are in a position where you are able to, please consider donating money to help cover the costs for those who are students or have limited means. Most of our memberships need to be renewed in the fall, so you may not qualify for the discounted rate unless you sign up for a new membership. You can renew your membership by clicking here. To register for the Anti-Discrimination Response Training, click here. In a controversial move, Governor Herbert has ordered the state of Utah to no longer fund Planned Parenthood. While Utah Planned Parenthood locations will continue to receive federal funding, they will take a major hit no longer having the state funding that allowed them to provide so many free services to women, none of which included abortion in the state of Utah. Governor Herbert’s decision doesn’t affect the organization of Planned Parenthood nearly as it affects the thousands of women in our state seeking affordable health care. Not only does planned parenthood prevent pregnancies through their free/cost-reduced birth control, they also provide women’s wellness services and gynecological care. We at UT-AWP stand with Planned Parenthood because we believe in affordable women’s healthcare. As our website is going through new changes, you will notice that our facebook site will be, too! We are planning on posting more frequently, especially to announce upcoming events both on Facebook and here on this website so that no matter where you may be, you’ll be updated and excited to get involved. Thanks for joining our membership! Now that you have paid your membership dues for the year, please fill out the following form so that we can have your information in our records. How did you hear about Utah AWP? What activities are you most interested in getting involved with in our organization?